Where were YOU back in 1979? Did you witness the Castrol ASEAN Rally? Do you remember seeing this car (picture above) in action? Do you remember seeing this car (picture above) in action? It was never “in action.” It was the official “survey car,” driven ahead of time along the route so that the organisers could make sure that the actual rally would proceed without a hitch (or rather, with as few hitches as possible). It’s a very good photograph, evoking memories while capturing a rare moment. And the “Keep Ipoh Clean” sign in the background is nice to see as well! 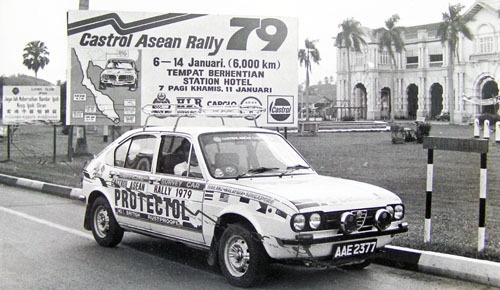 If you’re not familiar with the Castrol ASEAN Rally, you can think of it as a race from Thailand to Singapore to KL along roads and not-roads. Of the forty or fifty cars that started in Pattaya, not even ten made it to the finish line in PJ. The car in the photo is of course the Alfa Romeo Alfasud. Based on the quad round lamps, I’m guessing it’s the 1.5 ti. However, it’s interesting to note that the car featured on the poster looks very much like the Triumph Dolomite. I doubt if Triumph was even sold in M’sia by 1979. The Dolomite, especially in the case of the Sprint, was produced to counter the challenge from the likes of the BMW 2002 and the Ford Cortina GXL. The engineering innovation and development however was let down by poor build quality. On second thoughts, perhaps the organisers used the likeness of the Dolomite to lend ambiguity and impartiality to the image of the car on the poster. Dear Mano … Your mentioning the Dolomite reminds me that it was replaced in some markets by the Triumph Acclaim, which was definitely a triumph worthy of acclaim — but for Honda! In a mere two decades, the latter had advanced from selling only two-wheelers to becoming one of the most successful car-makers world-wide. Really an amazing story. And yes, I agree with you that the car on the poster looks very much like the Triumph Dolomite. Dear Ipoh Remembered, what’s even more amazing is Honda’s foray in motor racing. They entered Formula 1 with an all Jap factory team in 1964 and WON the following year in 1965! Only the drivers were American but the chassis, engine and team were Japanese. What’s even more incredible is, this is just 20 years after TWO atomic bombs were dropped on them! But I suppose that, if I pay tribute to the company for its creativity and high standards, I should also mention that the founder spent the years 1937-1945 supplying Japan’s war machine with engineering components. I do wish he hadn’t! That really is amazing for Honda. Thanks, Mano. On the other side of the globe there is also the success story of an iconic German brand and the murky past of it’s patriarch. Driver should be my Dad. Hi, Kok Wee Ming, could you provide us with photos and a brief of your dad’s exploits, please? Also, how the Alfasud Ti fared and what became of it? Thanks!